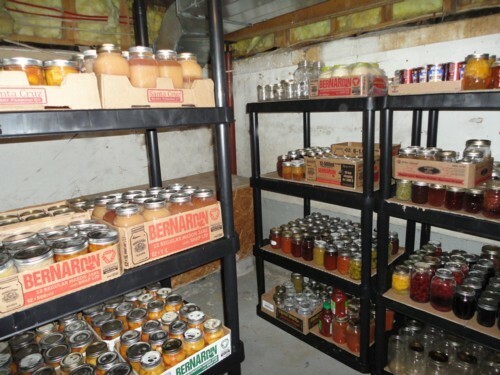 This is a oldie but good post on canning tips.. Ten in total and its a longer write up. Hope you will enjoy some of the idea’s that will save you time in your canning season. Just a few of my shelves with canning in my cellar, I have currently have eight sets of four shelves, each shelf can hold 200 pds evenly, each shelve fits four canning box’s for a total of 48 jars per shelve in box’s and up to sixty when not in box’s, In total right now I have room for about 1200 jars. I have to chuckle when someone wrote, “Did you sleep last week?” when I listed what I had gotten canned in the week” Don’t get me wrong on this, I was very busy and it was very much full-time work, on the other hand, I thought I might give a few tips I have learned either from my grandma/Mom/Aunts or myself over the years when it comes to canning large amounts. I actually have two All American pressure canners ….. smallest holds 7qts/14pints, the larger 14qts/21pints. I can use either/or – and most times use both at the same time as I have the wood cookstove – so large surface. They’re not cheap – but considering most things I can must be pressure canned, they were a worthwhile investment. I have two pressure canners at this point as well, both hold 18 pints or 7 quarts and can be done at the same time. perhaps at some point in time, I will get a all American pressure canner, I like that they don’t need the rubber gasket.